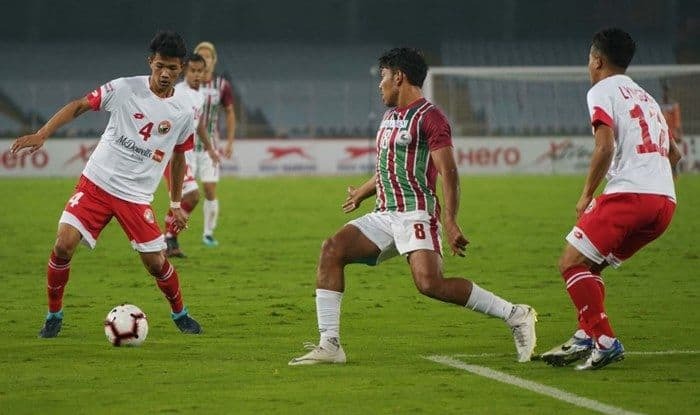 Mohun Bagan eased past rock-bottom Shillong Lajong 2-0 at the Vivekananda Yuba Bharati Krirangan here on Sunday to move to the fifth place in the I-League standings. After a disappointing defeat in the derby against East Bengal, Mohun Bagan have come back to consecutive victories and defeated Shillong Lajong in their latest encounter by the scoreline of 2-0 at the Vivekananda Yuba Bharati Krirangan in Calcutta on Sunday to climb up to the fifth spot in the I-league. After a barren first session, second-half goals from Yuta Kinowaki (48th) and Henry Kisekka (60th) helped the former champions move to 15 points from nine matches. They are level on points with arch-rivals East Bengal and Neroca FC, who are third and fourth respectively due to goal difference. East Bengal also have a match in hand. Mohun Bagan have now won two games on the rebound after losing the hotly-contested Kolkata Derby 2-3 exactly a week ago. The Sankarlal Chakraborty-coached side beat reigning champions Minerva Punjab FC by a solitary goal in their previous encounter. Lajong, on the other hand, remain at the foot of the table with just four points to show from nine games. Chances were few and far between in the first half as Dipanka Dicka warmed Lajong goalkeeper Phurba Tempa Lachenpa’s gloves in the 16th minute with a powerful right-footer. Lachenpa was called into action again four minutes later and the custodian brought out his best with a brilliant diving save to keep Omar Elhussieny at bay after the Egyptian tried his luck from distance. The home team were dealt a blow when in-form midfielder Sourav Das picked up a knock and had to be replaced by veteran Mehtab Hossain. It was all Mohun Bagan for the rest of the half as the former champions failed to find an opener going into the break. Mohun Bagan coach replaced U-22 player Azharuddin Mallick with Sheikh Faiaz after the break and three minutes later, Kinowaki mad the most of some slack defending to score a peach of a goal. Lajong could have equalised moments later but Sankar Roy pulled off a superb save in Mohun Bagan goal to stop Samuel Kynshi. At the hour mark, Kisekka doubled his team’s tally with a strike from close. Lajong struggled to get anything together after the twin blow and it ended 2-0 at the final whistle.